There were excellent stories in this book, but sometimes they were a little slow to appear. Way too much time was spent on the on the military jobs--good information but slow reading. Overall, good, but I would only recommend it to big Eisner fans. I actually stopped reading this book halfway through. I found it dull, plodding, and directionless. Eisner himself recounted some of these stories himself in comic form in "The Dreamer" and "To the Heart of the Storm," both of which were recently reprinted in the excellent Life in Pictures collection. Here they're retold artlessly and uncritically. If it's true that cartoonists lead uninteresting lives compared to the subjects of most biographies, then it falls on the biographer to put their subjects' work and lives into historical or critical context. This book read like a report written by a disinterested high schooler. Needless to say, I would not recommend it. 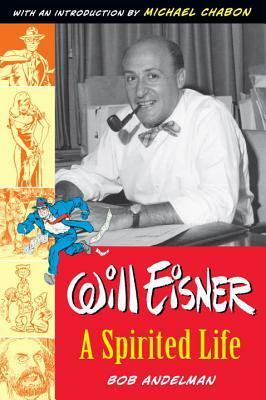 A pretty decent biography of one of the founding fathers of comics. Bob Andelman Michael Chabon Neal Adams - Bob Andelman is the host and producer of Mr. Media® Interviews. He is also the author or co-author of 15 books, including The Wawa Way with Howard Stoeckel, Building Atlanta with Herman J. Russell, Fans Not Customers with Vernon W. Hill, founder of Commerce Bank and Metro Bank UK, Mind Over Business with Ken Baum, The Consulate with Thomas R. Stutler, The Profiler with Pat Brown, Built From Scratch with the founders of The Home Depot, The Profit Zone with Adrian Slywotzky, Mean Business with Albert J. Dunlap, and Will Eisner: A Spirited Life. He is a member in good standing of the American Society of Journalists and Authors (ASJA) and Society of Professional Journalists).